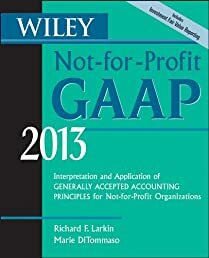 Wiley Not-for-Profit GAAP 2013 is a comprehensive, easy-to-use guide to the accounting and financial reporting principles used by not-for-profit organizations. Written with the needs of the financial statement preparer, user, and attestor in mind, this guide provides a complete review of the authoritative accounting literature that impacts all types of not-for-profit organizations. At the same time, Wiley Not-for-Profit GAAP 2013 features many examples and illustrations that will assist professionals in applying authoritative literature to real-life situations.